Thank you to Hada Cosmetic Medicine for sponsoring today’s Chambana Mom to Know. Hada provides advanced cosmetic medical services and products in Champaign and surrounding communities. Hada has combined a spa-like setting with state-of-the-art cosmetic medicine treatments to effectively reverse aging and environmental damage. For information about Hada’s services, contact the cosmetic medicine center at (217) 693-4400. 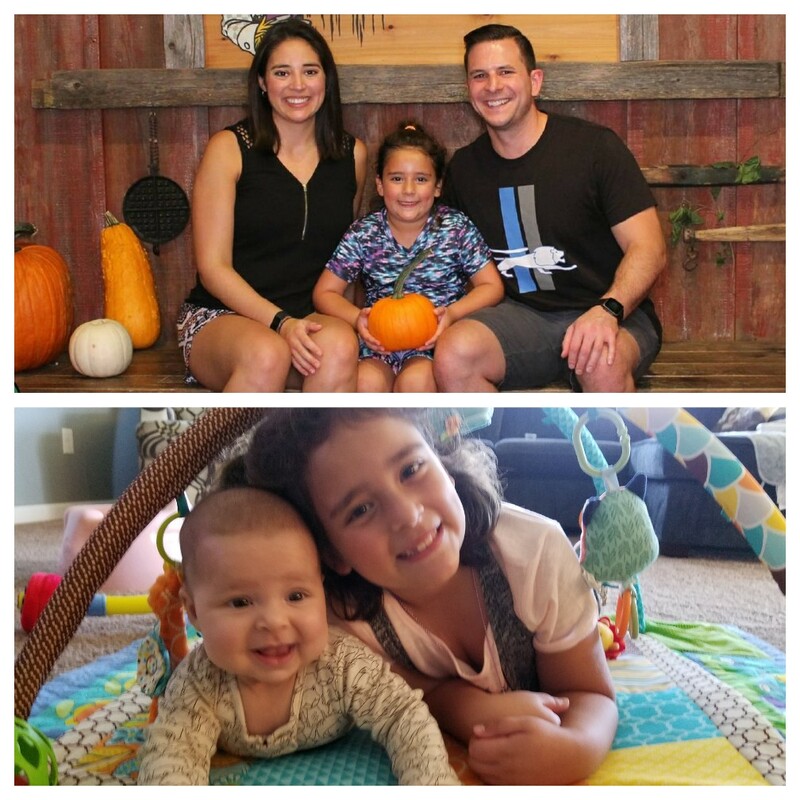 Top: Katherine Tellez and her fiance Paul flank daughter Elena, 7. Bottom: Elena with her 5-month-old brother Colin. Photo courtesy Katherine Tellez. Q: Congrats on having your second baby. What’s your favorite thing about being a mom? I LOVE being a mom. It really is the best job, even on those difficult days. My favorite thing has to be watching them grow up (but if they could slow down just a little bit, that’d be great!) I love Elena’s excitement about learning new things and seeing Colin’s smile when he figures out something new. Q: You’ve had a few months now as a mom of two. What have been some of the challenges, and what about some of the benefits? The hardest part has been balancing my time. I was so used to focusing all my attention on one child. While there was definitely a learning curve, we seem to have figured it out. I do try and give them both one-on-one time every day. The best part is watching how close they are already. Elena is such an amazing big sister, and I can only hope their bond grows stronger as they get older. Q: What is one thing that perhaps you never had, that you want for your kids? I would love to give my kids the gift of travel. I didn’t travel much as a child and now, as an adult, I don’t travel as much as I’d like. I want them to experience different places and cultures around the world. Q: What do you enjoy most about being an anchor? I’ve always been inquisitive and I like investigating a story and putting the pieces of the puzzle together. Sharing the information people in the community have a right to know is important to me, even if it doesn’t always make everyone happy. Q: Tell us about one of the more memorable stories that you have reported, and why it sticks with you. When I moved to Peoria, it was a few weeks after the tornado that hit Washington, Ill. (about 10 minutes from Peoria). For the next year, I reported on several follow-up stories … from families who lost everything, to the businesses and people who helped in the days after. However, it’s a story I reported on a year later that sticks out. I talked with first responders about their experience that day: what they saw, how they reacted, learning about what kept them going. One police officer I spoke with lost his home, yet his first reaction when the tornado passed was to grab a pair of work boots and start rescuing other people, not even thinking about what he lost. Another firefighter drove toward the tornado to rescue someone who was outside. I think we often don’t think of these people as “people” and their stories of that day have always stuck with me. Q: You’ve lived all over Illinois, and I’m sure have good memories of each stop. What makes Champaign special to you? Champaign is where Colin was born and where Elena became a big sister. No matter where I end up, Champaign will always hold a special place in my heart because all of our memories as a family of four started here. We plan on being here a while, so it will likely be the place all of his “firsts” happen. Q: It’s a summer weekend in Champaign-Urbana, what are you doing for fun with your family? Lounging by the pool! We love spending the day swimming or reading by the pool. Q: Tell me something most people don’t know about you. I’m a vegetarian, but most people don’t realize I’ve never had meat (not even fish) in my life.